I've known of Andric's The Bridge Over the Drina for sometime, so perhaps I loaned a copy of Devil's Yard in subconscious anticipation that I might actually track out and read a copy at some point this year. Devil's Yard translated by Kenneth Johnstone was published in this edition from John Calder in 1964, so this edition has just notched up it's fiftieth birthday, the inside copyrights mention that the book first appeared in the translation in the United States in 1962, the book was originally published in 1954 as Prokleta Avlija. Set at the end of the Ottoman Empire the book opens with the death of a Brother Petar, the other inmates itemising his possessions reflect on the stories that he told, and in an omnipotent kind of fashion the narrative begins, relating how Brother Petar, acting as a kind of emissary from Bosnia came to be imprisoned in the harsh jail on the outskirts of Istanbul. The inmates are a cross section of men from neighbouring countries, mainly comprising of men from the lowest echelons of society, the prison is ruled over by Draconian chief warden, Karadjos, whose past is entwined with the criminal fraternity that through a twist of fate he is now charged to rule over. The narrative begins to take a different course with the arrival of a new cell mate for Brother Petar in the form of Djamil Effendi, a peculiar young Turk who not long after his arrival is taken off to what is described as the White Tower for preferential treatment, he stands out as a special case. In Brother Petar's cell, Djamil, is replaced with Haim, a garrulous inmate who relates the story of Djamil, a son of the city of Smyrna, born of parents of mixed nationalities, his mother a Greek and his father a well respected Turk, Tahir Pasha, the story of Djamil's parents is one laced with tragedy, with the premature death of his sister, and the mental anguish of his mother, brought on by grief due to a twist in the story involving the funeral at sea of his sister. As Djamil grows older, we learn that he was thwarted in love and turned to study and travel, inheriting his father's estate after his funeral. 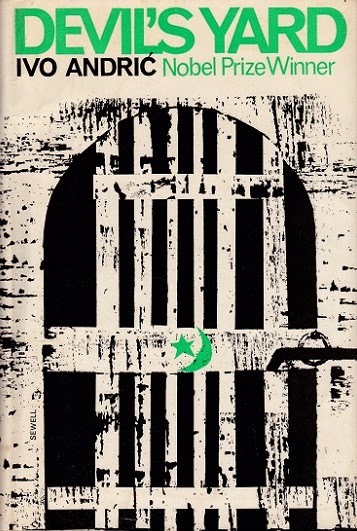 An aspect that remains slightly unclear throughout the story is the true reason of Djamil's incarceration, which only becomes clearer towards the end of the novel. Djamil is known for his studious nature in particular is his interest in the story of Djem Sultan and his fight with his brother Bajazet for the throne of Turkey after their father, Sultan Mehmet passes away, Djem Sultan's story is related and is a story of betrayed allegiances, as at first he finds sanctuary on the Island of Rhodes with the Knights of Jerusalem, but then is sold off at first to the French and then to the Pope, the image of Djem arriving at the port of Civitavecchia is one that is returned to later in the narrative, and it feels that Andric is emphasizing this momentus occasion with it's powerful imagery. This intrigue sees France and Rome using Djem for their own ends, an attempt to invade Turkey by the French and also in an attempt to spread Christianity to Turkey by Rome, and at the same time Bajazet is involved in the subterfuge in paying ransoms to ensure Djem's incarceration and away from Turkey. It feels that Andric's is using the story from the 15th century in a subtly allegorical way, and also it relates to Djamil's predicament in the novel, who is under suspicion from the authorities due to his research into Djem Sultan, caught between the two religions and unable to find sanctuary, as the narrative observes - But for Djem no such possibilities of escape exist. All the inhabited world, ranged into two camps, Turkish and Christian, contains no refuge for him. Djamil's is a suspect and perceived a threat to the reigning Sultan and Caliph, as the novel progresses Djamil begins to confuse himself with Djem, when relating the story he refers to events occurring to Djem as being to himself. Devil's Yard has made a good companion over the past few days, which transports the reader to several moments in Ottoman/Turkish history and proposes interesting insights to them, it's quite a short novel at 125 pages, and some of the names had me turning to the internet to learn more about the historical story of the feud between Cem Sultan and his brother Bayezid II, there appears a few incongruities, one being the date of the death of Mathias Corvinus, which I think the modern reckoning of the date of his death is somewhat later than it appears in the novel. As to the fates of the characters of the novel perhaps I'll leave it to you to discover their fates.